One of the new settlers was a 32 year old blacksmith, Christian Auricht. With his wife and four children he settled first in Glen Osmond, then in Klemzig and finally in the new village of Langmeil. There he acquired the largest allotment of land. Once cleared he planted a mixed fruit orchard and a Shiraz vineyard. The property remained with the family until the 1930s when it became a winery called Paradale. By early 1970 Paradale had been taken over by Bernkastel Wines. Bernkastel continued its business until 1988 when its crushing operations ceased and by 1993 the cellar door was closed. The property was purchased in 1996 by three local businessmen whose families have lived in the Barossa Valley for several generations, Richard Lindner, Chris Bitter and Carl Lindner. They restored the remaining old buildings and the village well, refurbished the winery and named it Langmeil, after the original village. Some of Christian Auricht's original vines still remained, a 31/2 acre patch of the 1840s Shiraz, albeit neglected. The most important task was to revive them. The vines are dry grown, and after careful tending Langmeil's first vintage was hand picked in 1997. Like many wine growing regions, the Barossa has had its dark days. One of the worst was in the mid 1980s. Australia was experiencing a glut in wine production and export markets were very small. In South Australia the surplus was such that the government believed they had to intervene. They offered a bounty of $1500 per acre to growers to pull out their vines and they could not replant for seven years. The purchase price of grapes hit an all time low of $150 per tonne for premium Shiraz (in 2003 premium Shiraz earns $5000 per tonne). A lot of local growers accepted the offer and many prime vineyards disappeared. Fortunately, a small group of Barossa winemakers understood the significance of the rare old vines and refused to destroy them. They lobbied and educated the consumer, the media and the government and promoted this unique aspect of the region. A delegation of Masters of Wine was invited from England to sample Australia's finest wines including some from the Barossa. This was the turning point. The praise the wines received brought big orders. The United Kingdom started what is now a global demand for Barossa and Australian wines. It is said great wine starts in the vineyard. Langmeil's commitment to 100% premium Barossa wine certainly upholds this philosophy. Paul Lindner, chief winemaker, is involved in the winemaking process from vine to wine. Through liaison with growers, he sees how the seasons affect the fruit; he learns then recommends the best practices to ensure optimum quality. By keeping individual vineyard parcels separate throughout the winemaking process, he can assess each vineyard for consistency and quality every vintage. 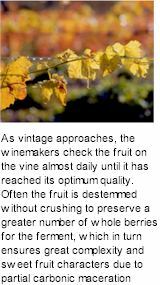 Such differentiation also highlights the varietal characteristics of each subregion. This process is crucial in ensuring wellbalanced wines with subtle complexities. Langmeil obtains much of its fruit from old, prephylloxera and own root vineyards throughout the region, in order to guarantee the quality and consistency of its wines. Pruning methods vary according to variety and region within the Barossa. The most common methods are Rod and Spur (Cane Pruning) and permanent arm Spur Pruning. To maximise the quality of the fruit and capture the essence of the vineyards the right equipment is needed. 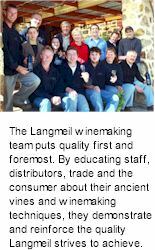 Langmeil is a small, family run business and it has taken a few years to acquire all the equipment required to create our special styles of wine. The synergy of new and old world equipment has helped to capture the characteristics in each variety and protect the subtleties of individual vineyards. Thus the high quality of Langmeil's wine is assured. Langmeil dry grows many of its own vineyards and encourages its growers to do the same. Because they are not irrigated, the vines search for water and push their roots deep into the ground. Thus they produce fruit of outstanding quality, with depth, colour and flavour not found in other, irrigated vines. Australia is the driest continent in the world and South Australia, the state in which the Barossa is located, is the driest state of Australia. Yet it is possible to produce in the Barossa outstanding wine from dry grown vines.